CIRCU5 is no longer a one-man freak show. Joining me (Steve Tilling) are Mark Kilminster (ex-Tin Spirits) on bass and vocals, Greg Pringle (Roger Daltrey band) on drums, and Matt Backer (Julian Lennon/ABC) on guitar and vocals. We're busy rehearsing our act and can't wait to perform at these shows. Please come along! Fancy a CIRCU5 t-shirt? All-new limited edition t-shirts will be available at the shows. To get yours before they go, click here. Thanks so much for your support. Every ticket, CD and t-shirt you buy means we can keep making and performing music for you. And please spread the word about CIRCU5. The more we can get on board the merrier. Here's to seeing you at the shows! P.S. If you don't have the CIRCU5 album yet, you can get a personally signed copy here. This season’s must have fashion item is here… the all-new CIRCU5 T-Shirt… available in L, XL, M, S, XXL . Just £10 plus postage (UK, Europe and Rest of World). It's CIRCU5 - the band! *ANNOUNCEMENT* Ladies, gents and non-gendered life forms… introducing the all-new CIRCU5 band! Matt Backer - guitar and vocals. I've played with Matt for many years in Johnny Warman's band. A virtuoso, he plays with ABC and has a solo career that's really taking off (Matt Backer Music). He has great vocal talents, axe skills, teeth and hair. Mark Kilminster - bass and vocals. Mark is the frontman and bass player for fellow Swindon rockers, Tin Spirits. A mind-blowing singer and bassist, he also has great teeth and hair. Greg Pringle - drums. Greg also plays with me in Johnny Warman's band. A fabulous drummer, he's played with Roger Daltrey and in The Who's Quadrophenia shows. Young. Fit. Teeth. Hair. … and me (Steve Tilling/Grady) - lead vocals and guitar. Clawing frantically to keep up with these other talented buggers. Crap teeth and hair. Our debut live appearance is at the FUSION 2019 festival on Sunday 24 March 2019 at The Civic in Stourport. Get your tickets at https://www.ticketsource.co.uk/whats-on/stourport-on-severn/the-civic-stourport/fusion-2019 - and tell your descendants you witnessed CIRCU5's first live show. I'm so chuffed I'm no longer the sole freak in CIRCU5, and that I have Matt, Mark and Greg accompanying me in my cage. Cheers - see you soon! Would you buy a discounted CD off this man? A year ago today, I released my first album - CIRCU5. The result of five years writing and recording, I put all I had into it, singing and playing almost everything (apart from some guest spots from great musicians like Dave Gregory, Johnny Warman and Matt Backer). I'm currently focusing on TC&I (with ex-XTC members Colin Moulding and Terry Chambers). But CIRCU5 will return. I still love the album. I hope you do too. "Roll up, roll up... see the man with claws for hands..."
I'm delighted to reveal the new video for The Amazing Monstrous Grady. Hope you like it! Directed and produced by Yvonne Wootton. Grading and special effects: Dan Sollis at Digital Distortion. Graphics: Stu Rowe. Featuring Steve Tilling, Johnny Warman, Dave Gregory and Lou Dommett Young. 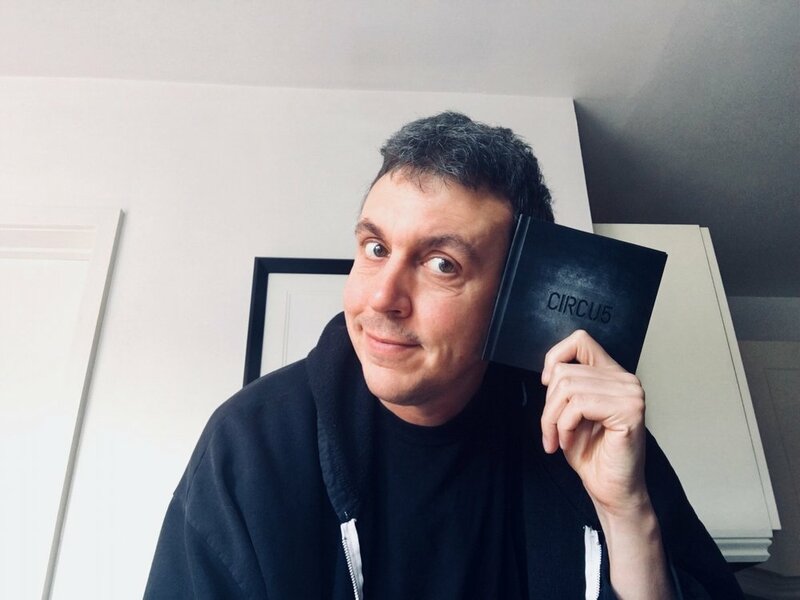 Check out this hour-long interview with Steve Tilling (Circu5) on the Pete Feenstra Feature from Get Ready to Rock Radio. In this special, Steve chats to Pete about his music and influences, and we hear tracks from the Circu5 album. Here's a new lyric video for the last song from the Circu5 album - 'The Chosen One - Ascension' - featuring Dave Gregory on electric guitar, and Matt Backer on additional electric guitar. Photography by Lou Young, and design by Rich Webb. I hope you have a great 2018. Cheers, Steve. Hi - thanks so much for supporting me in 2017. I hope you have an amazing Christmas and New Year.